Dejan Lovren was left on the bench for Liverpool’s win over Burnley on Sunday, and based on this video it was probably a wise decision from Jurgen Klopp. The Reds went with a centre-half pairing of Virgil van Dijk and Joel Matip, and despite conceding twice in a 4-2 win, they secured three points to get back to winning ways in a crucial boost for their Premier League title hopes. 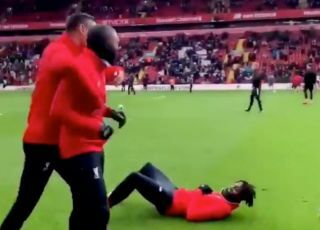 Spirits were high ahead of the game though, and it was at the expense of Lovren who was left red-faced in the warm-up after being nutmegged by his teammates three times in less than 30 seconds, as seen in the video below. It was captured on Liverpool’s official Instagram page so there is nowhere for the Croatian stalwart to hide, with his teammates rolling around on the pitch in laughter in a priceless reaction as they probably couldn’t quite believe that they managed it three times as he clearly didn’t learn his lesson.